I was buying a couple of items at my local Costco yesterday and saw the Logitech Harmony 620 sitting in a display for $99. I had been wanting a decent all-in-one remote that would help me integrate my primary entertainment set up down in my basement. The equipment is a bit dated but works very well, the only problem being the plethora of remotes that I need in order to make it all work properly. What looked interesting about this particular device was that it had a USB connector on it and would allow me to program it with my PC. This beat the old process I had to go through on a previous all-in-one remote that required a series of numeric entries into the keypad that felt like a game of Twister for my fingers. The packaging on the 620 indicated that it supported a Mac so I made the impulse decision to buy it. Turns out I could have saved myself $10 by buying it from Amazon/Target but I didn’t feel like driving back and returning it over $10. Once I managed to extract the device from the blister pack it came in—no small feat mind you—I followed the gigantic fold out instructions and popped the included CD into my MacBook Pro. I really wish the Logitech people would get their software act together, especially on the Mac side of the house. The software that shipped with the 620 was version 7.3.2. I detest software that requires a reboot on installation and this one required two, meaning I downright despised it. I seriously considered taking it back to Costco at that point but kept plugging through. Once the software was installed I followed the on-screen instructions and plugged the USB cable from my MacBook Pro to the remote. The software failed to recognize that the remote was plugged in. I tried the other USB port on my Mac, tried using a different USB cable and even went through the series of incantations that usually help me cure technical problems to no avail. It simply wouldn’t recognize the device. I ended up removing the batteries from the remote and plugged it into my Mac to see what would happen. The remote came to life, drawing power from the USB port, though the software still failed to recognize it. At least I knew the connection was good and that it was likely either defective software or a bad remote. Given Logitech’s reputation I was banking on defective software. I immediately jumped on the Logitech site to see if I could find some troubleshooting information on this. 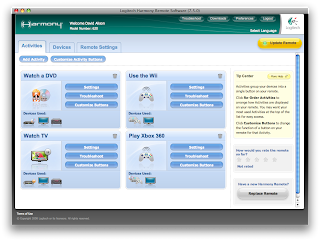 Unfortunately the Logitech site doesn’t even have the Harmony 620 listed as a product from them! This led me to conduct a more exhaustive search on the web to find out what was going on. It turns out the 620 is functionally identical to the Harmony 670, which was on the Logitech site. I deleted the old copy of the Harmony software that I had previously installed and downloaded the latest version directly from the Logitech Support site. They have rebuilt the software quite well and it now installed without requiring a reboot and it recognized the remote right away. The only catch in all of this was that I expected the remote to actively display that it was connected to my Mac through the USB port but it did not, or if it did it was so quick on the little remote LCD display that I missed it. Once the software was installed and running it took a little while to get it properly configured with my devices. I entered in the name / model number for my TV, PVR, Receiver and DVD player and it seemed to recognize them fine. I even added in the xBox 360 and Wii that we have hooked up to everything. The 620 was able to power up the xBox but could not handle the Wii since that apparently requires a Bluetooth connection. Once it knows your devices you can walk through a wizard interface that handles what device needs to be set to which input and what should and should not be powered on for each task. After going through the hell of getting the software to work properly with the remote this portion seemed to work great. Using the Harmony 620 is actually pretty nice. It’s got a very comfortable peanut shape much like the Tivo remotes I favored when that was my PVR of choice. With one exception the buttons are well placed, easy to “feel” for in a dark room and reasonably well lit after pushing the little “glow” button. The only button that caught me a couple of times was the Stop button, which is located directly above the rewind button. It was a little too easy to hit that while jumping back and forth on my PVR, which would pull me completely out of the show I was watching and require I navigate back to it. That little quirk aside I love that I now hit a single button and all of my inputs are properly set and I can jump between watching TV, a DVD or playing a game. One single button push on one single remote. The only thing missing is one of those little chains like they have at banks for their precious pens so that my kids won’t accidentally hide it. I’m not much of an audio or videophile so this was more of a layman’s perspective on setting this up and making it work. I actually wrote all of this down because of the problems I experienced in getting it all to work and the fact that I didn’t find solutions in one single place on the web. If you happen to buy a Logitech Harmony 620 and have a Mac, hopefully this post will be of help to you. Logitech, please get your software act together! I love your hardware but experiences like this one make it difficult to recommend your equipment. At a minimum you should list ALL of your products on your web site. If you happen to use/recommend a good, inexpensive universal remote please note it in the comments.